My prayers were answered! The Lamento CHIBIS ARE FINALLY BACK! luckly they refunded me…This figure is hardest to find out of all Nitro ones. Phew~ thankfully. The akira figure is sold out at most places, so I’m quite surprised that thisisanime is carrying it at quite a good price too. And another thing about Yesasia, sometimes they list items when they actually don’t have stock on hand. I’ve ordered a limited edition cd that was listed and they just cancelled the order without informing me few weeks later. But since I was paying by credit card, they didn’t make any charges first, so I wasn’t that upset. *blush* me too! Teacher moe XD Well, I was taught by one or two “moe-able” younger male teachers (30s) but honestly, now that I look back they’re actually not that good looking… ^^;;; but still… we had fun in class. The girls would go (quite typically) KYAAA~ at whatever our teacher did. I think he was quite frustrated with us tho. Frustrated sensei: YOU GIRLS AREN’T PAYING ATTENTION TO WHAT I’M TEACHING AT ALL! Oo~ I’ve read about “Miracle Noton”! I think the story is quite innovative! I’ve seen the CGs but I’ve not had the time to play it. I tried Enzai but I couldn’t get through it… too dark and depressing. Maybe I wasn’t in a good state of mind to play it at that time. I don’t remember even completing any route except getting one bad ending where Guys was killed. I hope other BL game companies would release figures of their games too. I’ll love to own some Vivid Color Hanamachi Monogatari chibis ^^ yupon style. XD Glad to help! They’re really fast huh! If you used EMS you’ll get them early next week kekeke… As for thisisanime, I read some mixed reviews about them… I think it may be good to pester them for a status report of your Akira. Have you paid for it yet? Sweetpool chibis figures!! I believe Nitro+ will make figures for them ^^ The fat guy will still look cute if he is also designed by Yupon (who did lamento and togainu chibis) He is also an important character in sweet pool after all. And I also want sensei chibi… maybe he’ll be a secret character? XD Oh and also Youji’s sister would be nice. I’m sure it is in stock. Don’t worry :) And trust me, you won’t regret it. Anyway, after mandarake processed your order, you can email them to quote you SAL shipping just to compare prices. It takes about 1~2 weeks longer to reach you but so far I’ve not encountered any issues. I just popped by yesasia… sheesh, everything Togainu they’re selling are all overpriced! Good luck on getting your Uniform Akira! Keep me posted huh. I love Nano his one of my favorites. I heard hes the most easiest to get when it comes to the coin chibi figures at random. Mmm… sometimes it happens *_* but I think you should still be able to find them on sale after they were released, since people may cancel their pre-orders. It’s a pity that most Japanese stores don’t ship internationally cos I often find out-of-print items on those sites. Togainu no Chi chibis are even cuter than the Lamento ones. 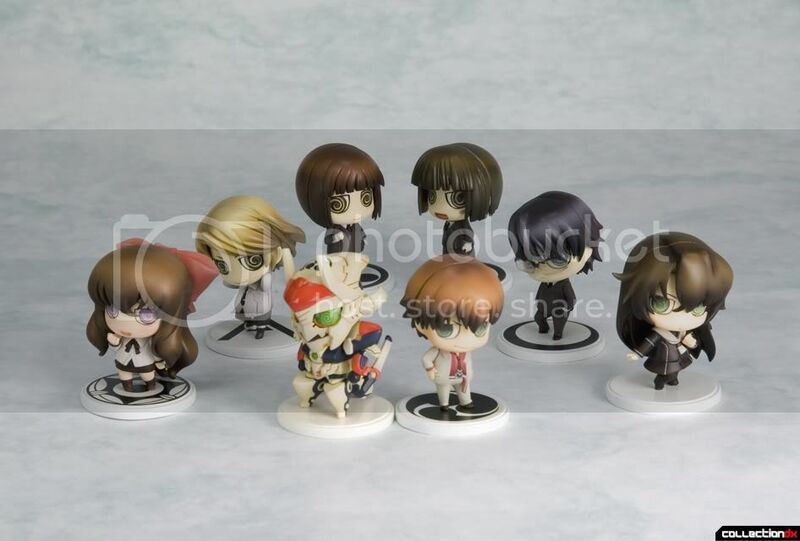 The secret chibi is the cutest ever :) It was reissued a few months back so I guess most places have already sold out. Hmm… If I’m not wrong thisisanime is a US site? what shipping method did you use? I’m not sure about them cos I usually order from other sites. I kinda wary about ordering anything expensive now though…have you ever ordered from this place? It really depends… some places might have already sold out during the pre-order stage… if you really really like it, why not order it from the shop you saw? Im really hurt. it makes me feel stupid too…. I didn’t expect any SALE for revoltech…. You both bought pink and black? It was almost lost in the mail I think cos I had to collect it at the post office instead of it being delivered to me. Two months? wah..but can track it anot? Depending on your shipping method… but Xmas does affect SAL more. EMS not as much. Last Christmas, I ordered Mirage of Blaze R1 DVDs from Rightstuf (USPS/SAL) during the sale, it took almost 2 months to reach me. As for the revoltech idol master i think im going to buy a pair. Looks more cute as a pair. Chrisan got her STREET FIGHTER action figures of SAGAT and RYU. She dressed up the boys as if a girlie XD i think she likes action figure…future collector perhaps? Yep tht could be the reason. Does XMAS affect the delivery time very much? You get ur items mostly by EMS, right? Erm yeah lol~ in the story, Cloud used to idolise Sephiroth until he betrayed them… right? Right? XD SO MUCH ANGST!!! XD They’re my first FF BL doujinshi pair. The kind of things we find on the internet when we were actually looking for something else *sweatdrop* that’s why I just cannot shake the image of them together. 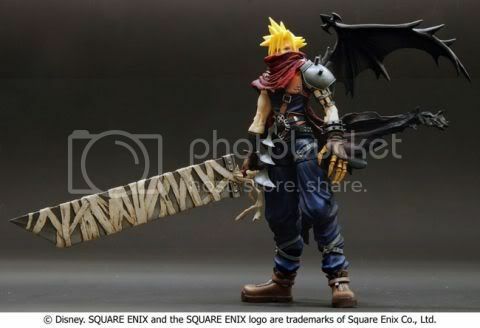 And if I buy Sephy, I must have Cloud x_x I currently have Advent Children Play Arts Cloud and Sephy. I didn’t buy the game versions tho. Well, so far, apart from screw ups like my SnapPs Konoe, this is the first production delay I experienced. I think most of the items I preordered were produced and delivered around the estimated arrival dates. The economic downturn might have been a contributing factor to the delay this time. Have you ever pre-order something and experience this kinda long delay before? SnapPs? Check out their website. http://www.snapp-s.com/ Currently there isn’t any new items planned. Those idol master revoltech girls are very sweet. Reasonable/cheaper price too. Which are you getting? I think both pink and black are pretty. Your girl can play with them too ^^ even better than Barbie? i dont mean to make some influence on you juz because im not keen on Togainu ‘Hold hands’ but the delay is quite annoying. While you’re waiting for them, you can miss some other good things. yup i notice than single-wing design. Haha definitely, bad guy is more fun_not in real life of coz. Do you hear more release news of SNAPS product? im going to buy a idol master revoltech just for fun. Yea… cos I realised that in general, certain figma releases are not as rare and they get restocked pretty quickly. Even Miku and Fate were reissued within the same year! So that removes my anxiety of missing out on any figma figures that I liked, unless if they are special edition releases such as Figma Suzaku. *rubs chin* Indeed… I think I’ll cancel the hold hands figures and wait for sale or when I’m richer. Oh you cancel your Shana? OMG. tht’s quite a delay. really annoying. well if you think you got something better coming up canceling them can be a good idea. who knows Togainu hold-hands will be on SALE on PA next year. Kya!!!! Will be very grateful if you make some post about them. As for Cloud im not sure…not a fan. i can only buy one and tht’ll be Sephie instead of Cloud. i hope the details are good. I’m seriously considering if I should cancel my Togainu hold-hands figures (T_T) Both Vols were delayed till December so I still have a chance to cancel them if I want to. 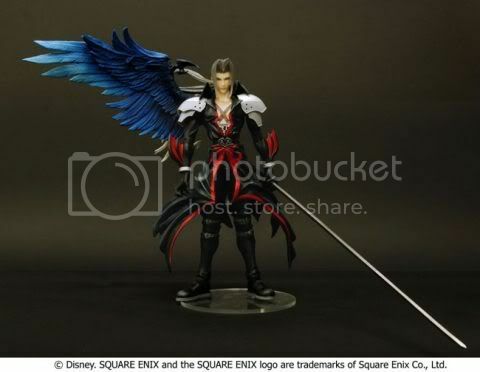 There are 2 upcoming Kingdom Hearts Play Arts Sephiroth and Cloud action figures that are awesome looking. They’re on my wishlist too. Might do a post about them later. One set is enuff for me, gotta save $$$ for future figure release of SWEET POOL. Previous Previous post: Goods: Gimme more Bishonen cuties from Final Fantasy!